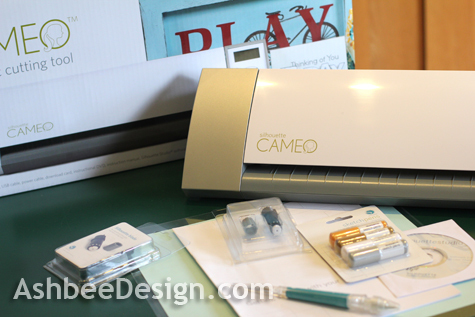 My very special husband gave me a Silhouette Cameo Cutting Tool for my recent birthday. (Yeah, it was one of the "big" birthdays). If you look at the various Christmas Cards I have created over the past 30 years you probably thought I already had one. No, I've cut all those cards by hand for years. When I looked at the specifications of this machine I knew I had to have one and learn how to use it. I am a Silhouette beginner and I hope to share with you some tips and tricks but right now all I can offer is hints for getting started. First let me note that no disclaimer is needed here. We bought the Cameo outright and have no connections with Silhouette so, yes all these opinions are my own. I am a tad geeky. Ok, maybe a little more than a tad so the computer side of this all makes sense to me. I thought the directions packet, software installation and demo DVD were all excellent - except for one little missing clarification. In the directions it emphasizes that when you insert the cutting blade be sure it is "pressed completely into the holder." I put it in and pressed. What the directions didn't clearly explain is that there is a fin on the cutter and the cutter is only in place when that fin is rotated all the way to the right. You can see the fin at the 4 o'clock position above. It looks like the following photo after inserting and rotating counter-clockwise. 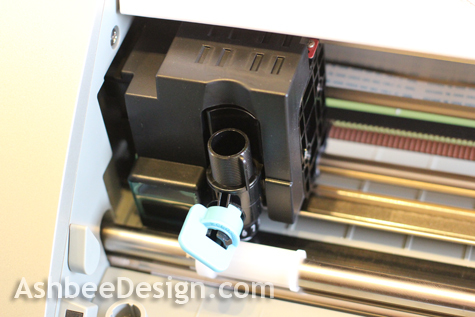 You must rotate the cutter, not press. Family had arrived to celebrate Thanksgiving and I had successfully unpacked, set-up and started the machine (amidst minor pandemonium) with no issues until the first cutting. It didn't go all the way through the paper. I tried several times, adjusting the cutter depth and was still having inconsistent cutting. I put it all away to again take out after all the guests had gone home and peace and quiet had descended upon Ashbee Hill. I had to dig around the Silhouette site but finally found a mention about the placement of the black fin. Once I did that then the machine cut beautifully. My next newbie problem is with the cutting mats. I chose a piece of card stock from my paper hoard to try the first successful cut. When I removed the paper from the sticky holding mat, the paper tore along the edges and stuck to the mat. This happened down both sides of the paper. I have found that as the mat gets used, it gets less sticky. Hopefully this problem will disappear but I need to do more research and experimentation. It does create a problem though because I have been planning to use the cutter to cut holes into a paper I will use as a card, not cut shapes that I will use. Here are some photos of my first quick experiment using a stock pattern. I took a piece of 32 Lb white copier paper and programed the cutter to cut out a delicate snowflake in one quarter. 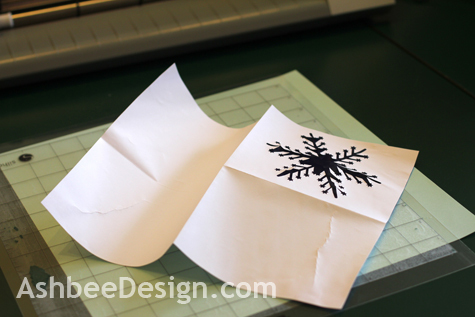 My ideas was I would fold it like a card and slip a colored piece of paper behind the cutout snowflake shape. The cut was successful but carefully removing the paper from the sticky mat caused it to buckle, crease and curl. I tried folding it like a card but the paper was just too damaged to be useful. 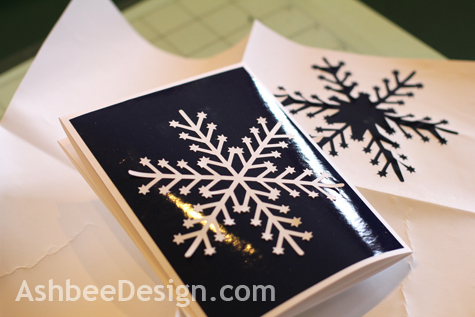 However, the shape that remained - the white snowflake was in beautiful form so I glued that to deep blue wrapping paper and glued all of that onto a white paper card. This is my first quick Silhouette project. I am wondering how to adjust the process so that I can use the background paper for some designs. I tend to think in negative space - not positive shapes. Overall I am very impressed with this tool. I am glad I haven't designed a card before getting it because its strengths are different than I anticipated. I need to go find a good discussion forum and am planning to spend some more time exploring the Silhouette site. More fun to come! This looks to be the same type of mat used on the Cricut. I have learned that a new mat can be "seasoned" by taking your hand and pressing it all over the surface. This tempers the stickyness but does not interfere with the workings of the mat. 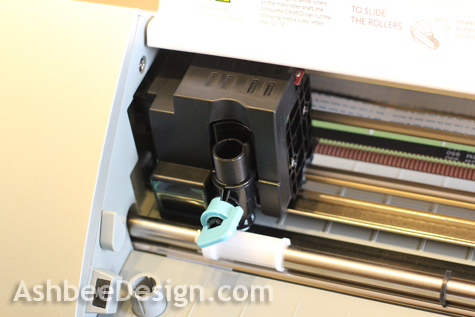 Also, I have Cricut tools that help to release the paper from the mat. One of them resembles a small, flat spatula. 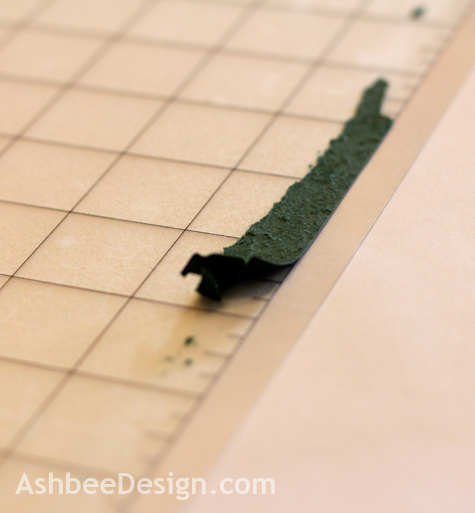 It does a great job of removing full sheets of paper without damaging the sheet. Go to YouTube and check out the Cricut videos on the subject. Have fun! I hope to add a Cameo to my arsenal someday. Great advice. I have found the more I use the mat, the less tearing. It is getting lots of use. Just wasted an hour with a "not so successful" project. More refinement to come. I had the same problem and did what Lynne suggested - press your hands over and over the mat. Some of the oil from your hands transfers to the mat, and it won't hold onto the paper so much. After using my mats for a long time, I'm having the opposite problem -not sticky enough, lol. I'm going to try washing them with warm water this weekend, which is supposed to help. If that doesn't work, I'll be trying some of the repositionable sprays. Your work is beautiful, enjoy that lovely gift! Patty, Let me know how that works out. How long does a mat last in general. I understand more complex patterns less often. Do you find yourself replacing it after 50 pages?